The Arab Spring, the Western Fall, and Burn Baby Burn! The current news of riots and violence by minorities and the disenfranchised continues to increase. The violence of the Arab Spring has spread to the West. In West Allis, Wisconsin, the investigation into 11 of the violent incidents on the opening night of the Wisconsin State Fair has resulted in the arrest of a 16-year-old African-American who reportedly told investigators he targeted whites. The Wisconsin State Fair has stepped up security since the attacks. In Philadelphia, some 50 teenagers were arrested for violating a newly enforced curfew for minors aimed at cracking down on mobs of young people responsible for random attacks on people as well as property damage. Britain struggles to make sense of its violent urban riots. 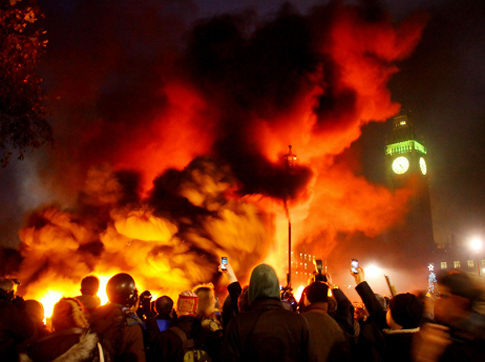 Throughout England people are still shaken and shocked by the worst urban riots Britain has seen in decades. Courts in London work day and night to process a stream of suspects, most accused of burglary, theft and arson, with some facing murder charges. Thousands have been imprisoned. According to the U.S. Census Bureau the average unemployment rate for teens ages 16 to 19 in Washington, D.C. was 50.1 percent as of June 2011. The violence in England raises questions about American unrest. Poverty, especially among minorities, and high unemployment, have led to a breakdown of social values. Social media, Facebook, and Twitter, designed to bring people together, has now become a major weapon for violence. As Americans look across the Atlantic, a natural question arises: Could the flames and violence that erupted in Britain scar America, too? The unrest is clearly due to economic discrimination by race and the widening gap between haves and have-nots. Peggy Noonan’s defending of the establishment shows either that she is completely how out of touch with reality or dishonest—probably both. David Cameron and Peggy Noonan reflect the views of those in power, and more importantly of the majority of the elected representatives of both England and the United States. This being the case, there is no justice to be achieved through peaceful elections. The only choice appears to be a revolution led by those who are oppressed, the minorities and have-nots—the underclass who represents, in fact, the majority of the American people. 4 comments to The Arab Spring, the Western Fall, and Burn Baby Burn! Obama should be trying to figure out how to get JOBS going in America, coz, at the rate we are going, the job #es will continue to drop! I think the US stock market will drop, long-term. With the job markets all down, who’s going to hire? These people can’t put food on the table, so they have nothing to lose! No wonder all the US prisons are full. People who cannot get jobs, commit crimes, – prison time- 3 meals a day and cable TV. All of our jobs are going overseas. Are the Republicans going to STOP their rich CEO friends from doing that? That’s what I would like to know? Just to make it clear: there is no excuse for rioting and burgling. But it’s also evident that have-nots are being sentenced severely (example: half a year for taking a bottle of water) whilst white-collar criminals who damage national economies by billions are being invited into Downing Street and the White House. QUOTE, “The expertise these men brought to the June Meeting at the Bedford apartment highlights the two new tactics the CIA was about to employ in its quest to conquer the world” 1) using LSD as a weapon of psychological warfare: and 2) turning drug smuggling routes into fifth columns that undermined the ability of foreign nations and undesirable minorities in America, to organize themselves economically, politically, or militarily.” END OF QUOTE. Page 132, “The Strength of the Wolf” written by Douglas Valentine. Today we know that Cocaine became the major tool for this work.